Zulkifli (P. Ramlee) works as horse stableman for Johan, the wealthy owner of a mansion. The young princess of the house Jelita (Normadiah) has the hots for Zulkifli and they carry on an affair rather blatantly in front of her brother Johan. But the lowly Zulkifli is despised and mocked at by Johan’s upper-class clique during a party at the mansion. Indignant at the condescension, he quits his job at the mansion to earn his bread as a freewheeling seaman. 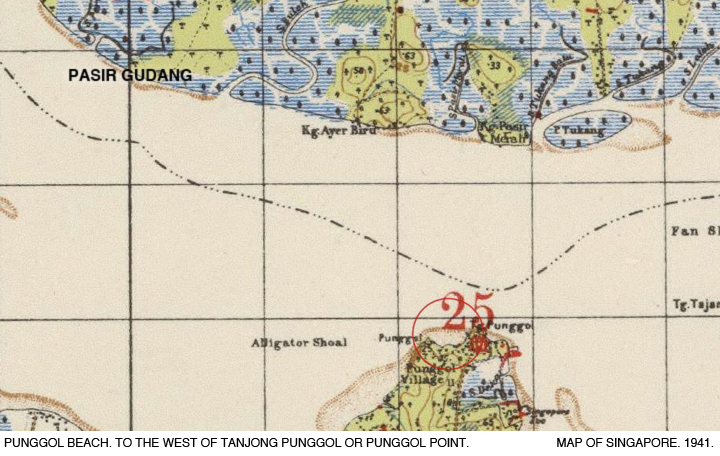 The ship Zulkifli is on hits a torrential storm that capsizes it, and he with two fellow sailors are washed up ashore on a beach (in reality the Punggol Beach at Tanjong Punggol or Punggol Point, which was becoming Shaw Brothers studio’s regular ‘stand-in’ location for fictional exotic locales, such as 1948’s Chinta [as a coastal village hideout for a royal princess in exile] and 1950’s Aloha [as the idyllic Hawaii]). Soon, the trio realizes, through a hostile experience, that they are on an isolated island inhabited by a fearsome indigenous tribe (and many safari animals, courtesy of wildlife film stock footage…) Zulkifli gains the trust of the tribal chief and the adulation of his beautiful young daughter (Latifah Omar, in her first leading role for the Shaw Brothers). He is then tasked to lead a group of islanders to seek a treasure trove hidden in a cave on the far reaches of the island. 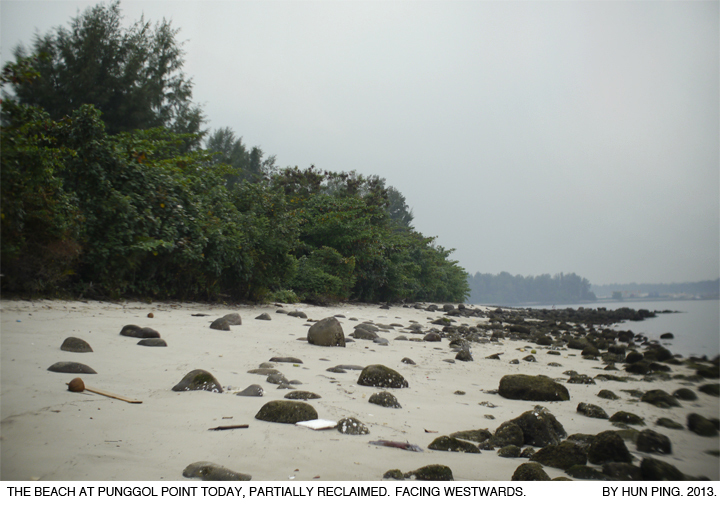 They tussle over the treasure when it is found and Zulkifli emerges as the victor, of the hard-earned riches, and the heart of the girl waiting at the (Sungei Buloh) coast for his promised return. 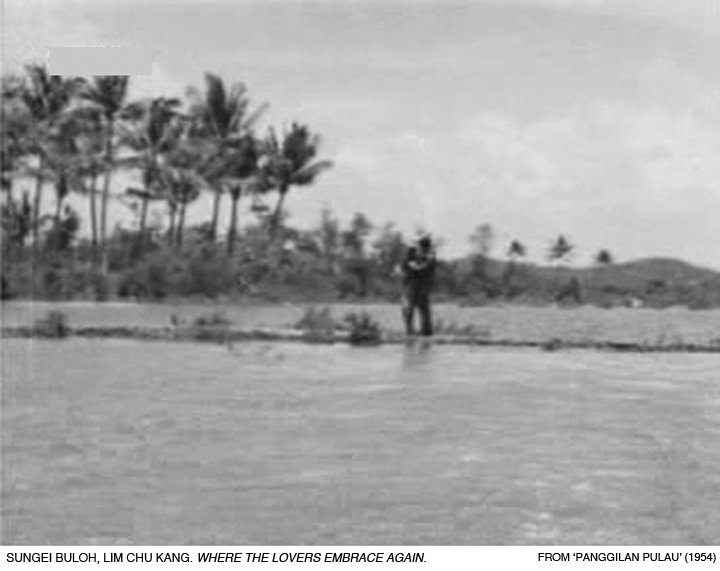 The embankment on which P. Ramlee and Latifah Omar, in character in Panggilan Pulau, raced towards each other’s embrace might have belonged to one of the numerous prawn farming ponds set up in the mangroves and tidal coastlines of the Sungei Buloh area (now part of the Sungei Buloh Wetland Reserve; Sungei Buloh means ‘bamboo river’ in Malay). The traditional method of prawn farming entailed the building of embankments around brackish waters where prawns would spawn, with sluice gates controlling the exchange of water in the pond with those from the sea (seawater with wild prawn larvae in it). 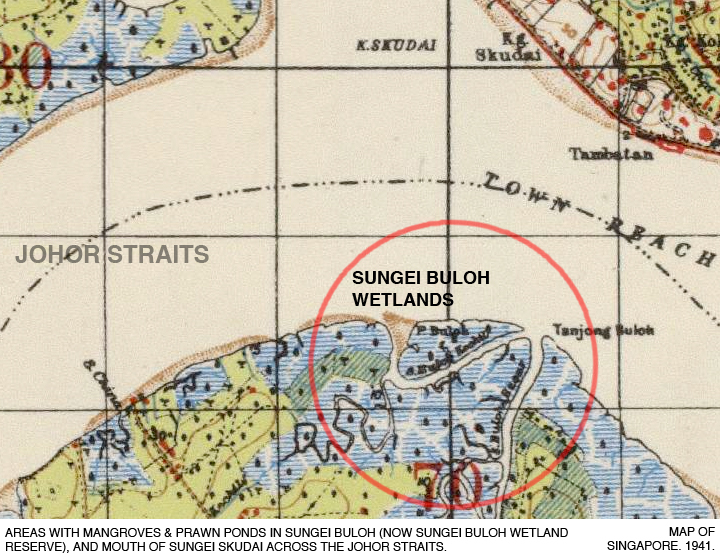 Those traditional prawn ponds that once thrived in the middle of the last century were progressively abandoned until there were only ten left when the government made plans in the late 1980s to preserve the Sungei Buloh region as a natural bird sanctuary under the suggestion of the Malayan Nature Society (Singapore Branch; since renamed ‘Nature Society (Singapore)’ in 1991). 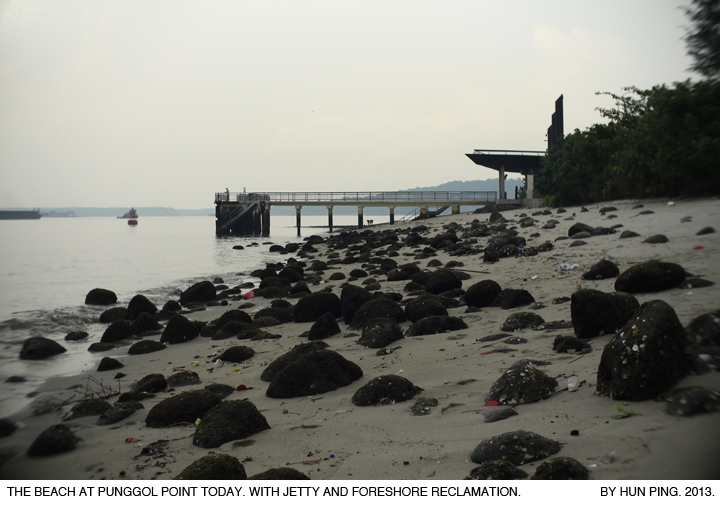 The abandoned prawn ponds were found to be good breeding and feeding grounds for migratory birds, and the existing sluice gates had helped to make the ponds flooded or less tidal, thus enabling the birds to feed on the mudflats. 1. Amir Muhammad, 120 Malay Movies (pp. 87-89). Petaling Jaya: Matahari Books, 2010. 2. Sungei Buloh Nature Park. Singapore Infopedia. National Library Board, 2005. 3. 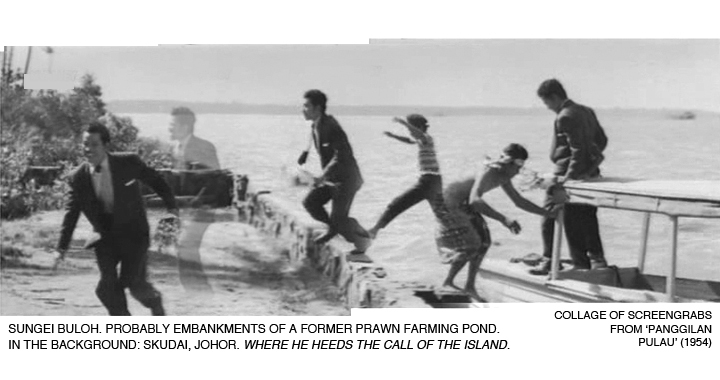 Lim Haw Chuen and Colleen Goh, ‘Prawn Farming at Sungei Buloh Nature Park’. WETland Vol. 5 No. 1, April 1998. Singapore: Sungei Buloh Nature Park. 4. ‘Bird lovers submit proposals for 300-ha nature reserve’. The Straits Times. 14 December 1987, p. 14. 5. ‘Strictly for the birds.’ The Straits Times. 19 February 1989, p. 14.